In the last week, I’ve seen 9 raptors, nearly half of them while I was walking down various streets of Brooklyn and Manhattan. My best day was Sunday, when I saw five birds of four different species in Green-Wood. This Merlin (Falco columbarius) was the highlight. 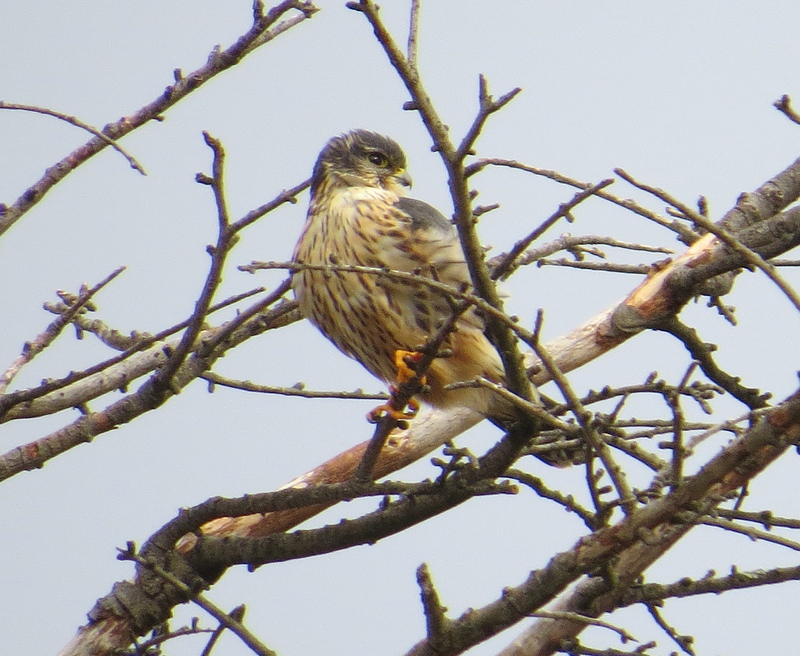 Merlins are falcons, just slightly larger than Kestrels. I was a little surprised to see this one — male, as the wings are slate blue/grey — since I usually see them during migration periods. But even then not always. They don’t seem to have taken to cities as well as Kestrels, but are beginning to make inroads. Kestrels are cavity-nesters, and they find decaying 19th century cornices a fair substitute for old tree holes. Merlins re-purpose other hawk and corvid nests for their own, assuming those birds don’t return. There are three subspecies of Merlin in North America (our is the Taiga), six in Eurasia. The name comes not from the Arthurian necromancer (who stems from this Welsh chap Myrddin), but the French name for the bird, esmerillon. The birds are also known as Pigeon Hawks, something reflected in their binomial, as columbarius means pigeon-like; they are about the same size as pigeons and are supposed to look like pigeons when flying. These birds, more specifically their European co-specifics, were known as Lady Hawks during the Medieval period, when falconry was the rage, for they were flown by women. These falcons characteristically perch on lookouts for long time periods, waiting for likely birds (House Sparrow, Waxwing, etc. ; a pigeon is too big) to pass by. They attack from the horizontal or below, not above like their big cousins the Peregrines. This one gave us very good looks from the top of its tree and was still there when we left.